Welcome to the website of Wexford Harbour Boat & Tennis Club. We are a members club run by, and for, its members. Located on the estuary of the River Slaney, and in the heart of historic Wexford Town, we are ideally placed to continue to introduce both Sailing and Tennis to all, with regular open events, camps and training courses. We are affiliated to both the Irish Sailing Association and Tennis Ireland and we host National and Regional Sailing and Tennis events. Coaching is provided by experienced and qualified professionals. Full bar with function areas overlooking the tennis courts and the River Slaney. It is available for members and invited guests use. Meeting room with Multi-media projector and ceiling mounted screen. The club has a fleet of dinghies and safety boats. Along with our slipway we also have a pontoon and mooring for larger boats. We have a crane rated for the launch of boats up to 7 tonne. Washing and storage facilities for boats,engines,sails,kayak etc. We are an ISA Accredited training centre and run an extensive programme of Sailing, Powerboat and theory courses such as Yachtmaster and VHF Radio Courses. Our Summer Sailing programme normally runs for 6 weeks for children aged 6 and over. We run a Winter Sailing Series every Sunday from November to March and have regular coaching sessions for Junior sailors. We have 4 floodlit all weather tennis courts that were resurfaced in 2015 with Domo Topspin Ultra artificial surface And we have just added 2 more hard courts. We have regular Adult competitions throughout the year and host the Wexford Senior Open Competition each August weekend. Our tennis pro runs regular clinics and is also available for one to one coaching. Each Summer we run a 5 week tennis camp for our juniors and host the Wexford Junior Open each August. After school coaching is provided by our pro throughout the school year with regular junior tennis sessions each weekend. Founded as Wexford Boat Club in 1873 as a rowing club, tennis was introduced in 1883. Sailing came to the club in the 1920's. 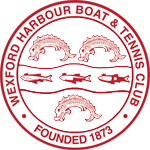 As tennis was such an integral part of the club, in 1994 we changed our name to Wexford Harbour Boat & Tennis Club or WHBTC as it is commonly known. Our club colours are crimson and white and the club crest and burgee is the old Coat of Arms of the Town of Wexford.